Hi, I’m Carley from Making It Up as I Sew Along, and this is my backyard. Actually, it’s my front yard, but my actual backyard doesn’t get much sun during the day. It gets so little sun that moss likes to call it home. I have aspirations of having a home farm, but, in the meantime, I am farming the yard I have. 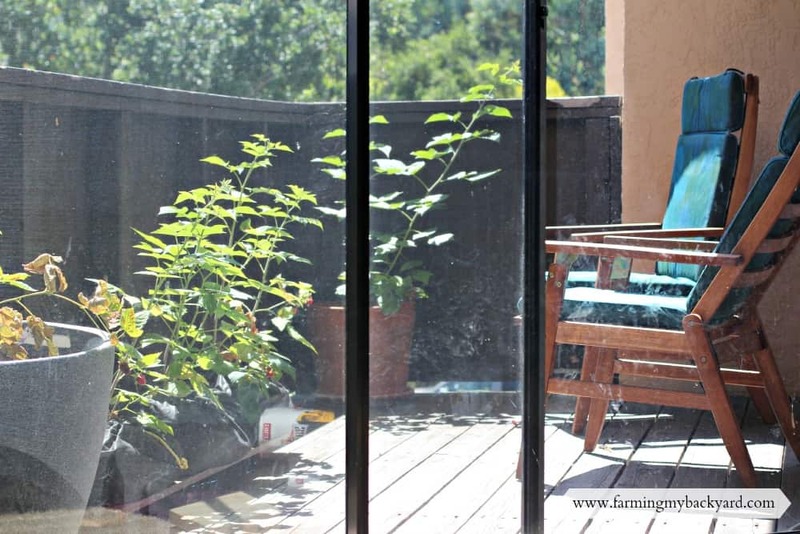 I love growing edible plants, especially fruit. So I ordered four bare root raspberries and one bare root loganberry from this website. When they arrived I did not yet have a place to plant them so I added a few drops of water to the bag they came in and put them in the fridge for a few days. In the meantime, I went to work on an idea I concocted. Since we rent, I wanted to be able to easily transport (and possibly replant in the ground at a later time) my plants without spending much money. The idea I came up with is potting bags made from ground cover fabric. With my awesome new tutorial you, too, can own these bags for the low, low price of… Sorry, I’m getting a little carried away. They are very inexpensive to make, and easy, too (assuming you don’t have a toddler around trying to pull the fabric around as you try to measure and cut it). 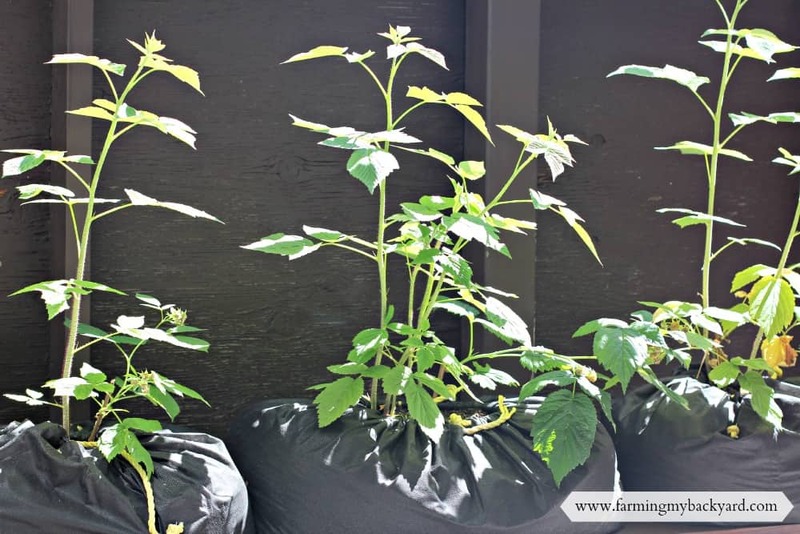 The measurements are flexible, but I have found that the smaller three-foot bags are easiest to move and, as you can see from the picture below, do not hinder growth compared to the larger one. 1) Roll out several feet of ground cloth. Leaving it folded in half, mark out a 3-foot section (or a 4-foot section for the larger bag) and cut. The fold will be either the top or bottom of the bag. 2) Fold the fabric so the newly cut end meets the opposite side. If you have time to pin, do so (I didn’t and it turned out fine). Sew this side using a 1″ seem allowance. Then sew the bottom (lining up all four layers of cloth) with a 1″ seam allowance. 3) Arrange the bag so that the bottom seam is on your work surface and the bag is sort of floppily standing up. Create half-square triangles at either side of the bottom seam such that the sides of the bag come down to rest on the bottom seam. The triangles should measure about 6″ or so on the shorter legs and the long leg should be perpendicular to the bottom seam (wow, that sounds more complicated than it is). Sew these triangles from corner to corner along the longer leg (or hypotenuse for you geometry types). Turn the bag so the seams are on the inside. 4) After you have made the potting bag, fold over the top 1.5″ to create a pocket for the rope. Stitch all around, following a line parallel to the top and 1″ down. 5) Carefully cut two slits about an inch apart through the two outer layers of the rope pocket. Thread some rope through one hole, all the way around the bag top, and out the second hole. I found it easier to work from a long piece of rope so I didn’t have to worry about getting it the right length. Cinch the rope slowly so you don’t tear the fabric at the slits. Don’t cinch it all the way yet. 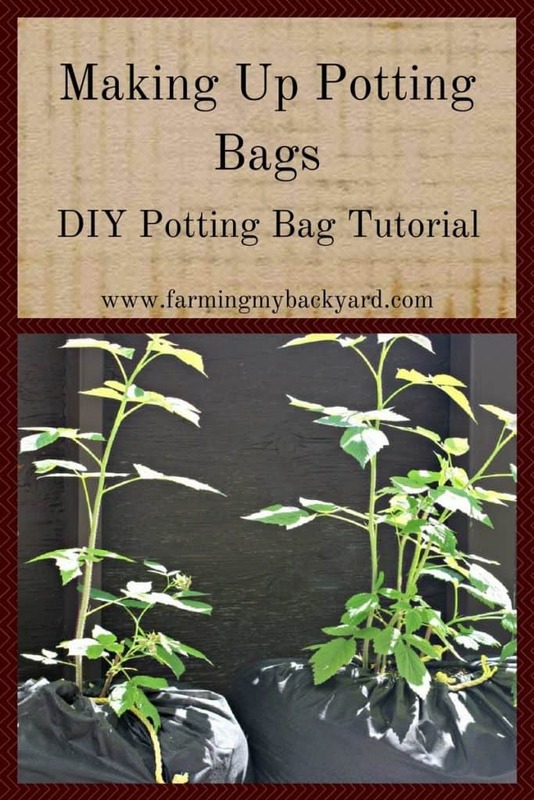 6) Fill your bag with fresh, organic potting soil. 7) If you are planting a seedling or bare root plant, put it in now. If you are planting seeds, you can do it after the final step. 8) Finish cinching the rope so there is a circle of dirt still showing and tie it up. Cut off any excess rope and knot or melt the ends to prevent fraying. 9) Stand back and be amazed. Oh, and don’t forget to water. Never again will lack of ground space, or moss in your backyard, prevent you from growing the food you want. For more sewing tutorials, check out my blog. 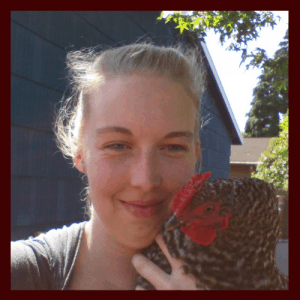 This is a guest post from Carley from Making It Up as I Sew Along. She’s a sewer, new mama, and “Jane of all crafts” so to speak. She enjoys creating and making things with her hands, whether it’s sewing, writing, gardening, or cooking. But the constant thread (if you’ll excuse the pun) throughout her weeks is needle arts. Please join her at Making It Up As I Sew Along. This is a GREAT idea. And so much more affordable than buying the bags already made! I rent, as well, and although my landlord is pretty chill and has even let me dig out giant patches of lawn for garden beds, I seem to always needs more containers! Awesome! Glad it sounds like it will work for you!